Want to be notified of new releases in d3v1l401/FindCrypt-Ghidra? While for years we used IDA Pro and its incredible plugins developed by its huge community, Ghidra came out recently (at the time of writing) showing a lot of potential and an incredible modular design for customization both in Python or Java. As most of you know, FindCrypt, a plugin made by nonetheless than Ilfak Guilfanov himself for IDA, is essential for quickly find references to Cryptography functions in the target and extremely useful in the field of Reverse Engineering. I'm trying to move to Ghidra and the very first thing I noticed is how important is the plugin to me, so I took the responsibility to migrate it, in Java, without sacrificing any signature and try to improve it as well. Move "findcrypt_ghidra" (database directory) into "C:\Users\your user"
Be sure Ghidra can access the "findcrypt_ghidra" directory both for reading and writing. Be sure Ghidra can access the "~/findcrypt_ghidra" directory both for reading and writing. Once you started your project and opened the disassembler, use the Script Manager window and search for "FindCrypt.java", by double clicking or pressing "Run" will execute the script and a result screen is shown if something is found. The database is a binary file I serialized myself, it's very easy to understand and very basic but functional for its goal. The database contains all of the 79 algorithms constants implemented by Ilfak, no sacrifices have been made while migrating them, while also adding more and more by the contributors. Open the "FindCrypt.java" file and find the '__FORCE_NO_DBUPDATE' variable (line 705). While the database is by design modular and can be updated automatically, the script can not; but the script will check the current version and prompt the user to check this repository latest version for download, with the list of changes from the new version. The script update message is prompt only once per session. 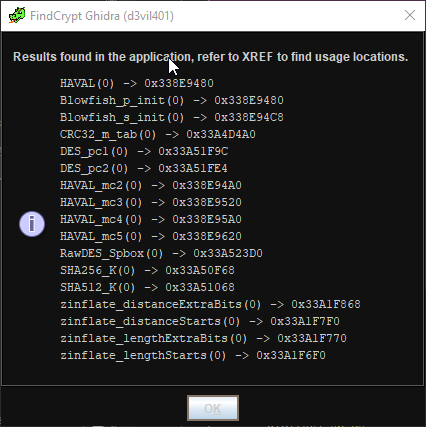 Proceed to download the latest version of "FindCrypt.java" and replace it in Ghidra's script directory. Also this feature is turned on by default, if you wish to disable it, follow above mentioned steps on '__FORCE_NO_SCRIPTUPDATE' (line 707). GNU GPLv3 - Refer to "LICENSE"